The whales are here! With whale populations growing each year and an estimated 33,000 whales expected to pass by our shores this year, the opportunities for sightings off Noosa and the Sunshine Coast have never been better. Whales head north in June, July and August to breed in the warmer waters off the north Queensland coastline and then travel south again to Antarctic waters from mid-August to November. So far there have been some exceptional sightings just off the headland of the Noosa National Park, a very popular viewing place due to the panoramic vistas there. Keep an eye out during your walk on the beach or around the coastline and you might be lucky enough to see the whales just offshore. The outdoor deck of the family-friendly Sunshine Beach Surf Club is also a great place to watch from. Operating out of Mooloolaba, Whale One (operated by Sunreef Mooloolaba) offers affordable tours with a 100% guarantee for whale sightings. Best of all they’ll transfer you directly to Mooloolaba from your Noosa accommodation. Prices start from $69 for an adult with an additional cost for transfers – please check their website for terms and conditions. And if sighting a whale wasn’t exciting enough how about swimming with one? Sunreef Mooloolaba has recently launched its latest attraction – Swim with Whales, Australia’s first swim with humpback whales experience. This 4-hour tour (from $149) offers the opportunity to enter the water on a rope line within 100 metres of whales when they are sighted. The whales may then choose to investigate and get up close and personal with swimmers. 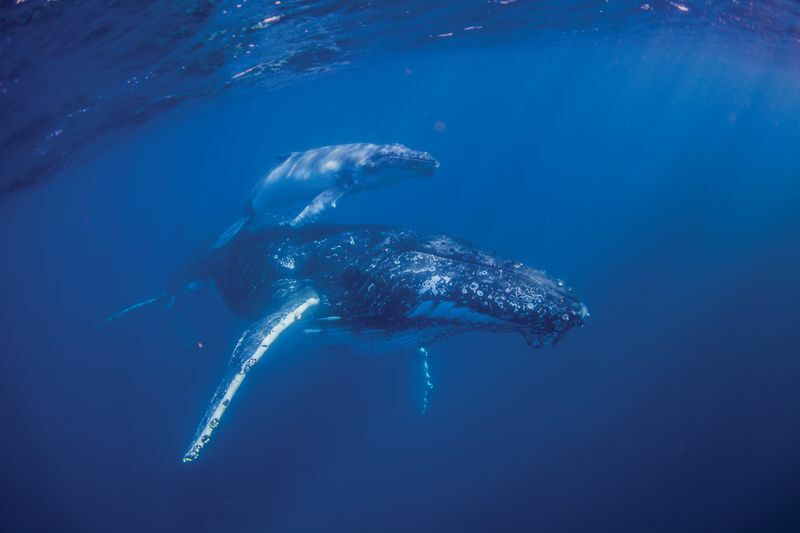 “The opportunity to swim with a humpback whale is a rare and very special one – something that people who have experienced it have described as life changing”, says Dan Hart, owner of Sun Reef Mooloolaba. “It’s truly incredible that one of the largest of mammals in our oceans is so graceful and gentle – they are just so trusting of human beings”, he says. See the Whale One website for more information and to book. Please note that swimming with the whales is up to the whales and is not guaranteed. During the early 50s and 60s around 40,000 whales were slaughtered off the south-east Queensland coast for their blubber and meat which was turned into stock feed for Australian farmers. The numbers of whales in the area became severely depleted. However, from an estimated population of 400 in the mid-sixties, Humpback Whales have since recovered strongly in the Southern Hemisphere migration cycle, increasing to more than 13,000 and continuing to grow by about 11% every year. Nowadays, the Australian Whale Sanctuary provides protection for whales within Australian waters 200 nautical miles off the coastline. There has never been a better time for visitors to Noosa to come and enjoy spending some time with these magnificent beings. Sunshine Beach Accommodation offers a selection of holiday accommodation in and around the Noosa area, including on the Eastern Beaches which are prime locations for whale sightings. Contact us today on 1300 810 944 and let us arrange your next Sunshine Beach holiday experience. Our experienced booking staff can book tours and activities, such as Whale One excursions and transportation, on your behalf to help you make the most of your Noosa holiday. Our Sunshine Beach Noosa Accommodation has the best Noosa holiday rentals in Sunshine Beach and Noosa’s eastern Beaches.